Glenwood High School has been named 2013 Special Olympics Illinois Outstanding Facility of the Year. 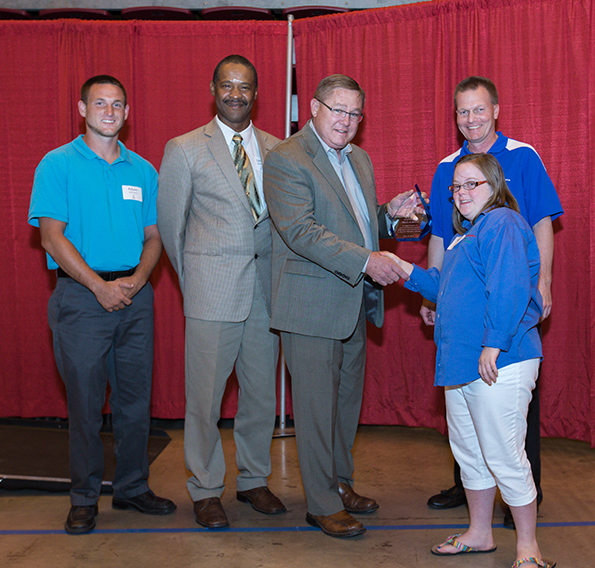 Dave Murphy, Director of Facilities and Grounds for Ball-Chatham School District #5, accepted the award on behalf of the school at a reception held on June 14 before the Special Olympics Illinois Summer Games Opening Ceremonies at Illinois State University in Normal. The Outstanding Facility Award recognizes a facility that offers benefits to the local Area program and/or state program in order to help promote the quality of competition provided for the Special Olympics Illinois athletes. Glenwood High School has generously hosted the Special Olympics Illinois Sangamon/Area 17 Spring Games at their beautiful facility for several years at no expense to Special Olympics Illinois. Athletic Director Dan Rourke and Director of Buildings and Grounds Jim Lovelace provide everything needed for the games from access to the facility to athletic equipment to scores of volunteers. As many as 150 volunteers from Glenwood High School have shown up the day of the event. Rourke is also the football coach, and he and his players can always be counted on to help with set-up and tear-down. He has been known to time them as they set up and make it a workout for the guys. In addition to Spring Games, Glenwood High School has also hosted Area 17’s Basketball Individual Skills competition and has been a resource for the Chatham Area Special Olympics to hold practices and use equipment.